We don't eat a lot of Mexican food and I tend not to make the high caloric favorites that graced the table when our children were at home. However, since today is Cinco de Mayo, I thought today's recipe should be Mexican or Mexican inspired. I didn't want to add another version of enchiladas to your already burgeoning collection and I thought you might enjoy the flavors of this quick and easy fiesta chicken. The recipe is straight forward. The chicken is braised stove top, but is finished under the broiler. While this is not necessary, time under the broiler gives the chicken a lovely orange glow. I use bone-in thighs for this preparation, but I remove the skin. The skin becomes flaccid as the chicken braises and, in my book, becomes inedible. I've tried cooking with the skin on and then removing it just before serving, but chicken prepared this way lacks the depth of the flavor I look for in a braise. I've found the best solution is to remove the skin, lightly dust the thighs with flour and then brown them using medium heat before adding liquid to the pan. The chicken is table ready in about 35 minutes. While there is a poblano in the sauce, this is not an overly spicy recipe. Let's get this done. It's time for a fiesta. 1) Combine orange zest, orange juice, honey, orange liqueur, mashed chile, adobo sauce, garlic, bouillon cube and paprika in a small bowl. Mix well. Set aside. 2) Season chicken with salt and pepper. Lightly coat with flour. 3) Heat oil and butter in a large ovenproof skillet over medium heat. Add chicken thighs and saute, turning once, until both sides are brown, about 6 to 8 minutes. Pour sauce over chicken and bring to a boil. Reduce heat and simmer, covered, for 20 minutes turning and basting halfway through. 4) Meanwhile, preheat oven broiler. Transfer chicken to a broiler pan. Broil 5 inches from heating element until bubbly and lightly brown. Transfer chicken to a serving plate. 5) Rapidly boil sauce to reduce by half. Adjust seasoning. Spoon over chicken. Garnish with cilantro and orange strips, if using. Yield: 4 servings. 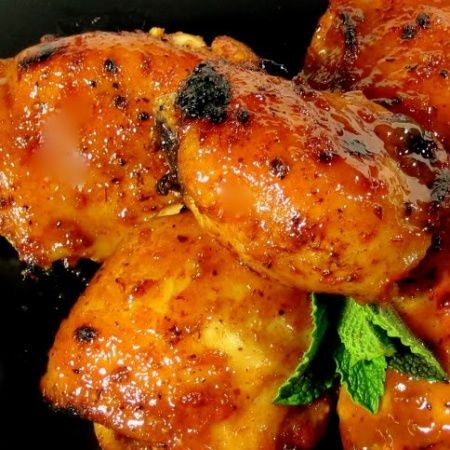 Oh Mary.. this is the most beautiful orange glazed on chicken that I've ever seen! Beautiful! This looks like a good dish for Cinco De Mayo -- and so much different that the cheese sauced dishes that one often finds in Mexican restaurants. I have chicken thighs in the freezer that have been staring at me. Now I know what I'm going to make. Beautiful! This looks and sounds wonderful! I bet the chipotle chili and the adobe sauce added fabulous flavor to the chicken! Fabulous! Looks beautiful and so delicious that I wanted to bite the screen! I'm saving this for sure. Looks like it has a nice spice without being overwhelming. What gorgeous coloring on the chicken, and so nice and healthy. Perfect dish for cinco de mayo. Just pass me some with a margarita. This looks great Mary! (and it would be perfect for entering in my May chile round-up...hint hint)! Love the looks of this chicken and bet it would be great paired with the orange couscous. Mary, can't wait to try this! We love Mexican food but it's so high in fat and calories. This one is actually healthy and would be fabulous with traditonal latin sides like plantains and rice. Thanks for a great recipe! Mary what else can I say but spectacular!!! Wonderful photos. Mary, Mary this looks way too amazing! I think I just decided what I am using my single can of chipotle chili in adobo sauce that someone sent me for! Too too beautiful! And the flavors! I am speechless! What a beautiful color! I was just trying to decide how to spend our cinco de mayo, and this sounds lovely. Especially when paired with a big margarita! Wow what flavors. Great pictures. Happy Cinco De Mayo. Mmmm. This looks and sounds so good Mary. I will be trying this recipe soon. Oh wow, just look at that color! I would definitely love this orange glaze. This is a beautiful dish. these are my kind of flavors. Your presentation and photo is brilliant! Love everything about this post!!! I love this! Perfect for Cinco de Mayo! That looks great with tons of flavor! Another great recipe. Geez Mary- you sure are one amazing chef and baker! Mary I have to make this! What an eye chatcher. Perfect for a celebration. Your pictures make me drool!! That chicken looks so delicious! Esi, welcome to One Perfect Bite. I hope you'll become a frequent visitor. Heather (onestepbeyond), thanks so much for stopping by. I hope you stop by often. This looks really good, Mary. Lots of 'orange-ness' going on in that chicken. Yum! Those are amazing! The color is gorgeous! Great glaze and looks so pretty! I think my kids going to love this dish! I will definitely try it. What a tasty and flavorful sounding dish! Great pics! This looks fantastic. I've only just found your blog - it's brilliant. I'm bookmarking this recipe for sure. I was wondering if I could try this with bone-in, skin on chicken. Jackie, my answer is "yes, but" The chicken skin will become limp and flacid when braised in this amount of liquid. You get the flavor but almost everyone will pull off the skin and leave it on their plates. What a recipe! It sounds like it worth the work. And the image is making me hungry! Delicious. I love the color on this chicken! I've not seen a Mexican version of orange glazed chicken. I'm anxious to try this out. I love the flavors of Mexican cuisine! This looks so yummy - I love Mexican food! All of your choices look amazing!